In a major set back to the Administration, H&F Council has been forced to admit that the tendering of its refuse service is in near chaos when all of the tenders it received exceeded its newly reduced budget. The Administration had been at pains to explain that the £1.5million cut to the refuse and street cleaning budgets would not cause a deterioration of its service - promising residents that it could buy "better and cheaper" on the open market. However, this has now been thrown into disarray when an official Council report going to the Conservative Cabinet on December 3rd explained that all of the tenders were well above the agreed budget and that it would therefore not be able to proceed with plans. 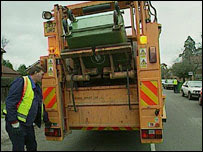 With residents, the Opposition and some back-bench Tory councillors complaining of increased litter and missed refuse collections, the beleaguered Environment Department has put out a statement saying that H&F Council will make “service adjustments without compromising a high quality service” and that these reductions will now cause a “delay in the award of this contract”. Many residents have expressed disbelief with some openly complaining at the incompetence of how this has been managed. Local resident Oliver Cardigan told me “The Council has lost all credibility on this matter. Everyone can see that the streets are dirty. There’s complaints of increased numbers of rats and other vermin and they still try and tell us that the service is of high quality. It’s just not believable”. I am appalled to hear that the dustman are in line to lose their jobs. Not only that, I understand that they put in a bid to run a privatised service for the Council after being told that was the only way they could keep their jobs. They had made the lowest tender and then, apparently the Council asked them to re-tender because it was not low enough. They haven't, as far as I know, won the business. It all seems appallingly unfair, especially when I understand the Council had earlier asked them to make cuts of a million and they almost did ... they achieved savings of £940,000. I can hardly believe it. I have always thought that the Council refuse collectors in our area were first class and this seems to me to be an absolute tragedy.